Slash and burn agriculture is a method that farmers use to grow food in areas where forestall or wildland is clear-cut, and they burn the remaining vegetation. The new layer of ash that covers the land will be a nutrient-rich layer for the future crops that will grow there. Nevertheless, when using this method, the land is only fertile for a few years. Then, farmers need to abandon the degraded land, moving on to a new plot. Hence, they tend to clear more forest as they do this. Slash and burn agriculture is a very popular method in Central America and Mexico. Nevertheless, nowadays more and more people want to use it, trying to survive as natural resources dwindle. Its impact is devastating and unsustainable. The use of slash and burn agriculture causes a lot of problems like the loss of habitat and species, deforestation and climate change. Deforestation is a direct consequence when farmers cut down forests for cropland. Due to the loss of forest, more and more carbon dioxide accumulates into the atmosphere, contributing to global climate change. Therefore, this farming technique has become well known as one of the most destructive ones. Rainforest conservationists consider that there more dangers than the eye meets, threatening the health of this fragile environment. For instance, in Indonesia, there are certain areas where farming occurs after farmers have slashed and burnt the land. After they cut the vegetation and trees, they live it on the ground, waiting for it to dry out. Then, they set it on fire. The layer of ash will help the new crops grow, boosting their development. After a few years, the soil will no longer hold as many nutrients as needed for the crops and farmers will move on, destroying another area. They leave behind a destroyed ecosystem which was once the home of numerous species of insects, animals, and plants. In order to recover and be used again, the land may need about twenty years. Generally, the slash and burn agriculture is practiced in areas where there is no open land for farming available due to dense vegetation. The list of regions includes Southeast Asia, northern South America, and central Africa. People from tribal communities use this agriculture method for subsistence farming. Humans had used this practice for 12,000 years when humans stopped hunting and gathering, and they started to grow crops. 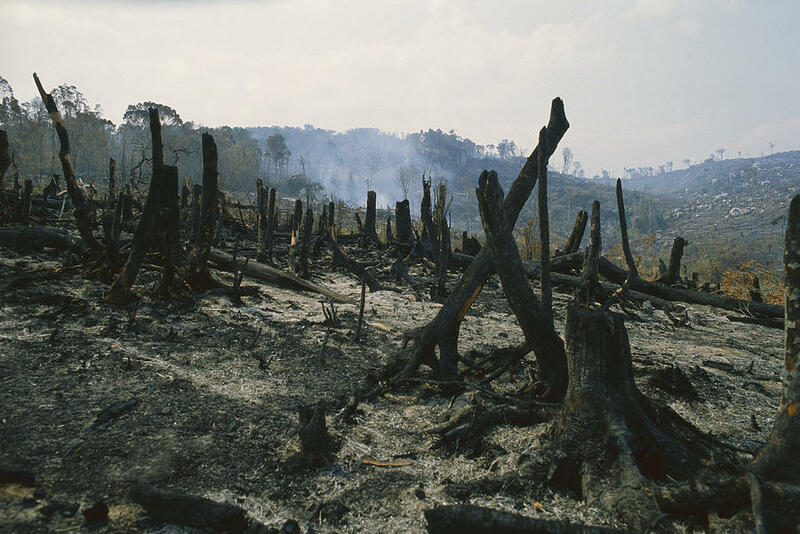 Nowadays, about 7% of the global population uses slash and burn agriculture today. This type of agriculture provides numerous communities with a source of food and income. Hence, by using this method, people are able to farm in areas where they usually cannot due to dense vegetation, uncontrollable pests, soil infertility, low soil nutrient content. One of the disadvantages of using slash and burn agriculture is deforestation. When this type of agriculture is practiced by large populations, they have to cut down a lot of trees to grow new crops. This leads to an increase in carbon dioxide levels. Furthermore, these high levels of CO2 boost climate change effects. Numerous species of insects, animals, and plants which were adapted to that particular rainforest are in danger due to slash and burn agriculture. After the trees and vegetation burn, these species lose their home. The tropical rainforest in Indonesia fosters a unique range of biodiversity. Therefore, the slash and burn practices affect a wide number of species which rely on the food and protection of native trees. Unfortunately, some of the most amazing creatures in the world live in the rainforest, and they are in jeopardy. In Borneo, the number of orangutans has dramatically dropped. Furthermore, many insects, bird species, elephants, and tigers depend on this vegetation. To remain healthy, all these animals need the shade, fruits, roots and vegetation of the rainforest. After this agricultural practice is used, the quality of the soil improves, getting a boost from the layer of ash. Nevertheless, after a few years, the nutrients dissipate, and farmers feel forced to move their crops, searching for another land. When they abandon the plots, the soil may take about 20 years to recover, regaining its optimum health again. Healthy soil is the result of a good relationship between the moisture in the area, insects, and native trees. The vegetation and trees in the area provide fruit and shade appropriate for the health of the soil. Therefore, slash and burn agriculture disrupts the natural balance of the tropical rainforest, dramatically affecting the soil. When people slash, burn and cultivate fields positioned next to each other, they damage temporary water storages and roots. These are lost, and they can no longer prevent nutrients from leaving the area for good. These practices also impair the health of local communities. Indonesia is not only home to unique species of animals and plants, but it also protects diverse communities of people. Many of them even live in the close proximity of the rainforest. The air pollution and smoke in the area due to slash and burn practices causes numerous health problems. The smoke can travel for hundreds of miles, putting at risk the health of the young and elderly people living all across this region. They may experience respiratory issues which may require the need for modern medical technology in order to be treated. Hence, the importance of the vegetation and leaves in the area is extreme. Without them filtering the air, the amount of health problems increases since pollutants accumulate in the atmosphere. The use of slash and burn agriculture has numerous disadvantages, and all the negative aspects are interconnected. When one of them affects the area, generally all the others follow. These issues occur due to irresponsible practices used by a massive amount of people leaving near rainforests. This agricultural method jeopardizes the life of numerous species of animals and plants, transforming them into endangered species.